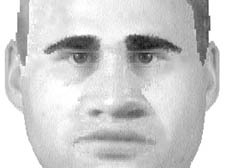 DETECTIVES have two suspect descriptions and an e-fit. The prime suspect is a stocky white man in his 30s who was wearing a black leather jacket. Police believe a second man in his 20s with short dark hair was with him and did not carry out the stabbings and may have been left horrified by the unfolding events.